Countertop dishwashers are the perfect example of getting the most out of a small machine. For an appliance that takes up as much space as a microwave, you can wash up to 6 place settings efficiently and effectively in a portable dishwasher. It is amazing how many features are fitted into such a small, compact package. If you’re looking for the perfect solution for whether you’re low on space, want to save on bills or only have a small number of dishes to wash, and then a countertop dishwasher is a perfect choice. For your convenience, the below list shows the 5 best selling countertop dishwashers available for sale on Amazon.com. The list is automatically updated once a day. 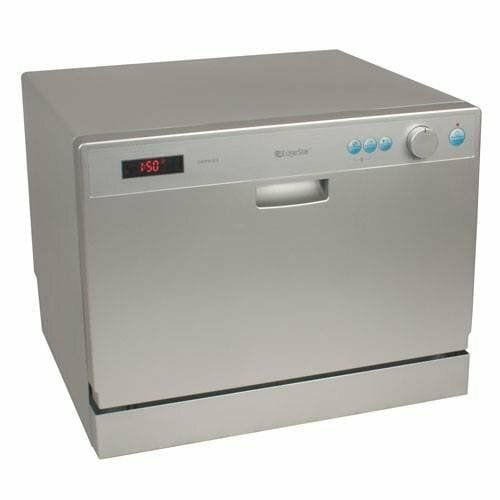 Apart from all having a 6 place setting, these portable dishwashers are energy efficient, can be connected to the kitchen tap with ease, and all have stainless steel interiors which prevent the occurrence of rust and ensures durability. Countertop dishwashers have a compact design which allows these appliances to perfectly fit under any cabinetry; they can clean a whole load of dishes using only 2 gallons of water which helps to save on water bills, too. 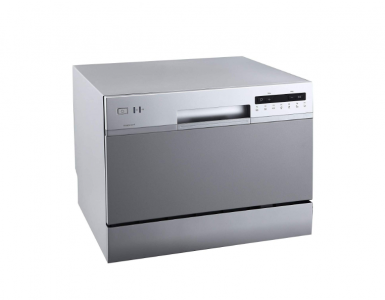 When shopping for the best countertop dishwasher, you need to consider its price, the number of features it has, energy consumption, energy rating, its size, the manufacturer and the duration of the warranty. See below as we outline the best countertop dishwashers on the market today. Thanks to improved technology and competitive pricing, you can finally purchase your own countertop dishwasher to make washing dishes in a small space a breeze. With the portability factor, these appliances can fit almost anywhere making them a perfect addition to your home or office. Below we have reviewed five of the most popular countertop dishwashers. 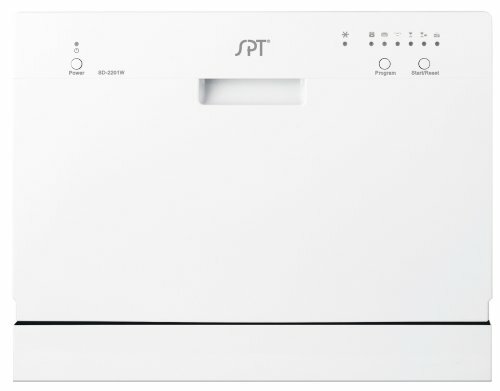 The SPT Countertop Dishwasher is a great product that is suitable for an office, an apartment or any smaller-sized kitchen. It is designed to be compact to fit under cabinetry, but when you open it up it is surprising how much it can fit. 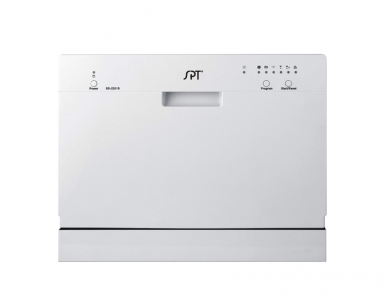 The manufacturer has ensured that the SPT Countertop Dishwasher is a powerhouse to be reckoned with as it can serve you with the same efficiency when compared to a full-sized dishwasher. This model is lightweight at only 48.5 pounds, making its portability factor a breeze for anyone. The SPT Countertop Dishwasher is all Energy Star certified, with an estimated yearly operating cost of only $24. Even though it holds 6 standard-sized place settings and has an impressive spray arm, it still provides these features in an energy-efficient design. Since it has been constructed with a durable stainless steel interior, you can be sure that you will use it for many years. An intricate dishwashing rack will allow you to also organize it on the inside, while the faucet adapter has been designed to work with the most common faucets in our homes. We love the dishwasher for being user-friendly and making it possible for anyone to use it. 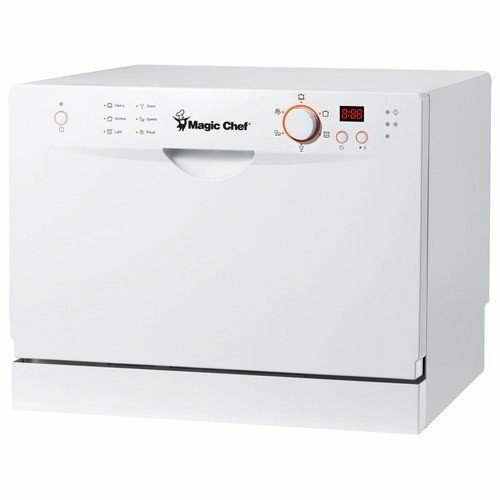 The Magic Chef Countertop Dishwasher comes with a very sleek design that is very user-friendly. Its appearance perfectly resembles a full-sized dishwasher by without taking up all the space. It holds 6 place settings with ease in its compact, 49.5-pound frame. 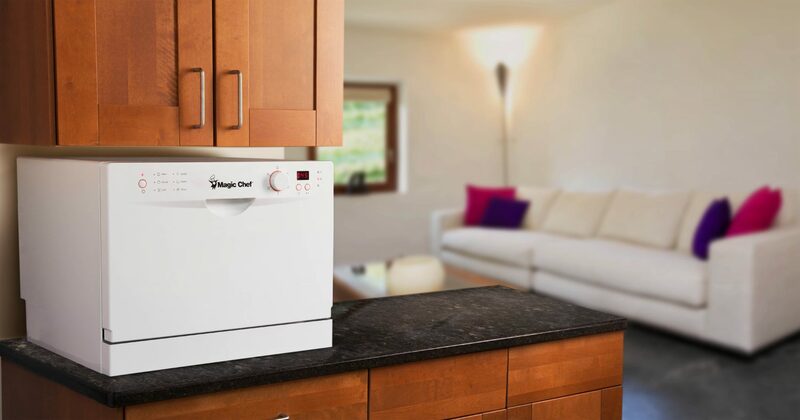 With 5 wash-cycle options, the Magic Chef Countertop Dishwasher will suit your washing needs. A quick setup kit is also included with your purchase to ensure you can install it and start washing your dishes right away. There is a quick attach nozzle that clips onto your faucet tap, and it only requires a regular plug outlet to generate power. This dishwasher has the ability to generate a massive 68-watts of power and includes 5 different washing cycles. The quick-wash setting is one of the very best and it will allow you to quickly run through smaller loads. With an anti-flood switch, you can be sure that it will never flood any of your counters. The SPT EnergyStar Portable Dishwasher is the perfect compact dishwasher if you have the floor space but have zero counter space to spare. This design is on wheels and is countertop height, giving you a little extra countertop to use when in-use. 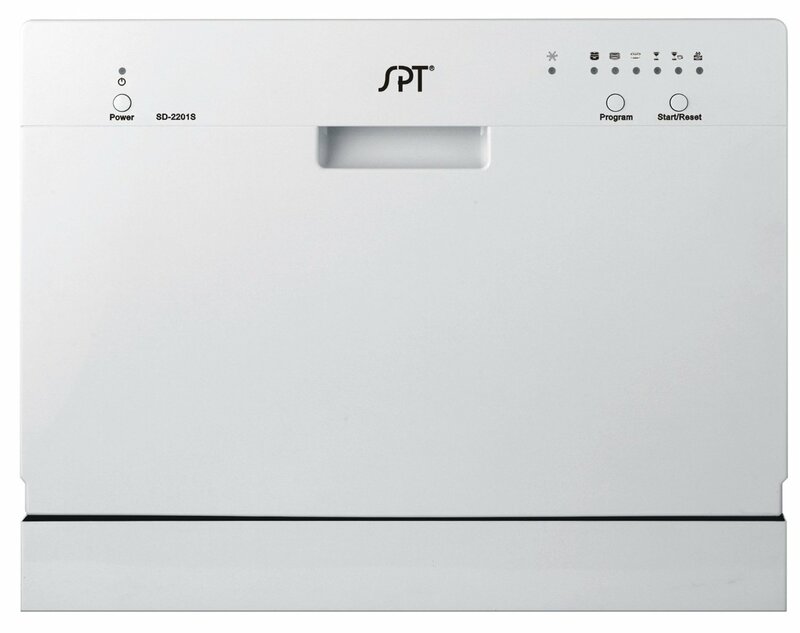 The SPT EnergyStar Portable Dishwasher has a spacious capacity that holds up to 8 standard place settings. This dishwasher is perfect for a bigger family or bigger office needing to wash more at once. 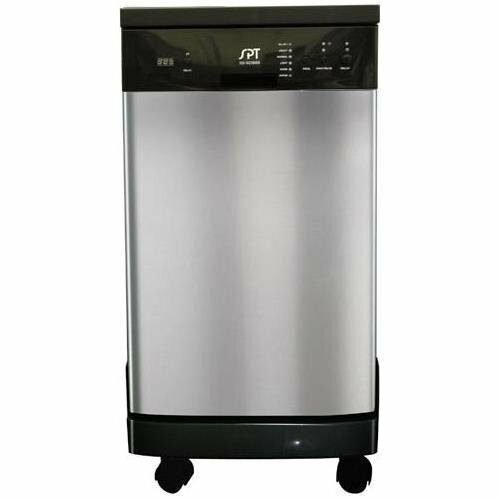 With this sleek, stainless steel outer design, the SPT EnergyStar Portable Dishwasher looks high-end and blends in with other stainless steel appliances. It is Energy Star certified and has an estimated yearly operating cost of $32. We find the time delay features here and you will also see it as part of a common theme amongst many of the other products on this list. 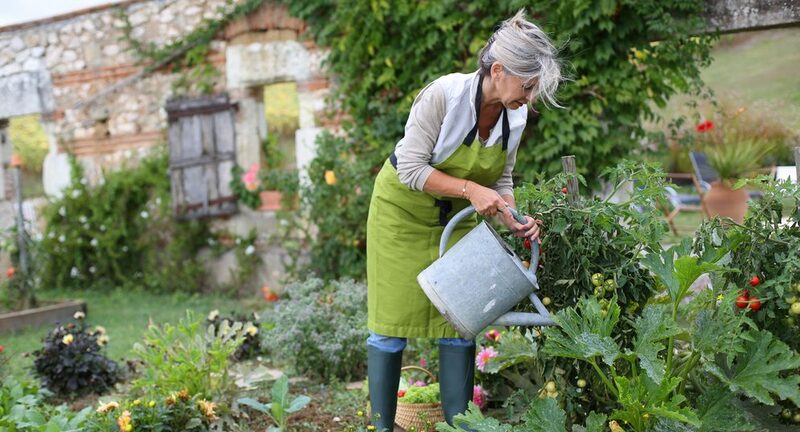 Multiple washing cycles will make life that much easier as you have different load sizes and a faucet adapter that is universal will work on most of your different faucet types. 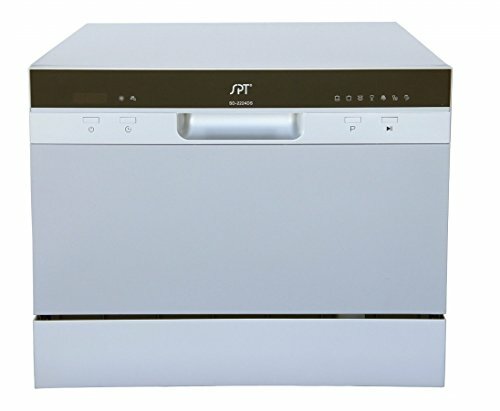 The SPT Countertop Dishwasher with Delay Start provides a sleek, silver look with perfect portability. 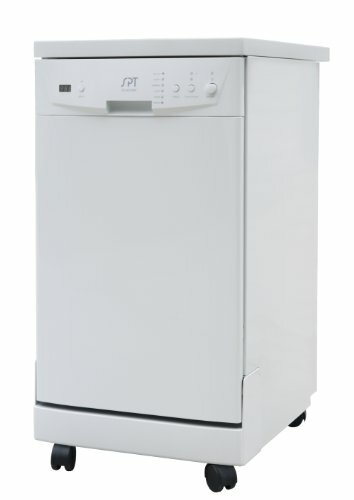 With 7 different wash cycles, this dishwasher is perfect for washing several different types of loads. The delayed start feature just adds that touch of convenience to delay washing for up to eight hours. This sleek design has an LED display to easily be seen in dimly-lit areas, like under a dark cabinet. It uses 120 volts and is only 43 pounds, making it portable enough to be moved around from spot to spot. Give your home or office that full-size power it needs with this compact design. Since it comes with a universal faucet adapter, you can use it with any faucet that you already have in your home and an LED display look that will indicate some of the essential things that you need to know. The water supply indicator isa also an excellent way to warn you before something does go wrong. 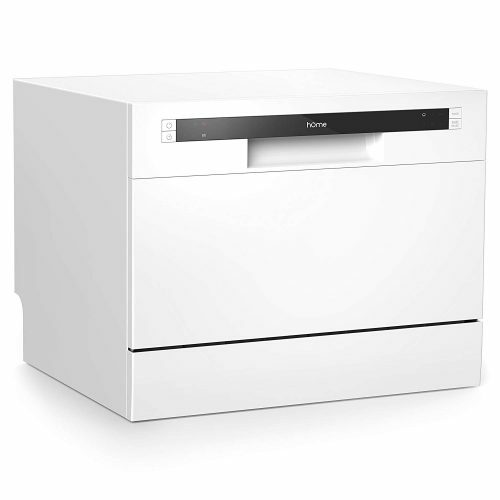 The Costway Countertop Dishwasher provides all the power and convenience of having a full-size dishwasher but without taking up all of that space. The capacity inside can easily accommodate up to 6 standard place settings making this a perfect addition to an office, small kitchen or apartment. This portable dishwasher includes push-button electronic controls that are very easy to use. It has a stainless steel interior to prevent rust and inside is a durable rack, silverware basket and cup shelf to allow for easy distribution of your place settings. The EdgeStar 6 PlaceDishwasher comes with a digital control panel that is fitted with an LED display. 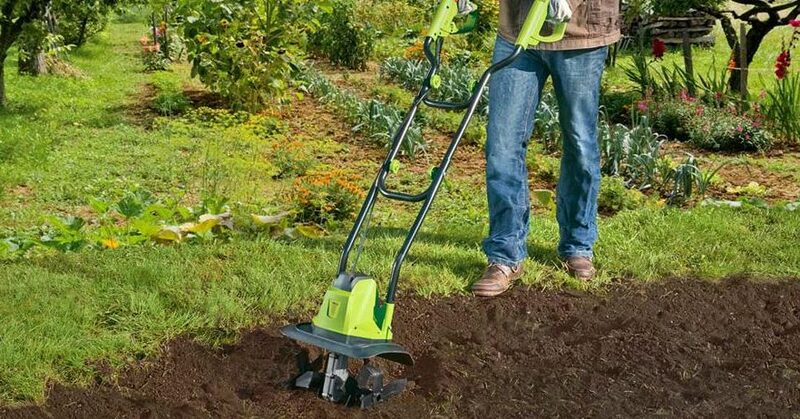 It is designed to hold plates that have a diameter of up to 10.5 inches. It has a delayed start feature which is perfect for programming it to start when you want. The product also comes with the child lock function which helps to prevent any accidents when children try to open it. The dishwasher requires an input voltage of up to 120 V at a frequency of 60 Hz. It has a compact design which allows it to fit in most cabinets. The stainless steel interior ensures durability and protects it from rust. If you are looking for a dishwasher that uses only 200 Kilowatts of power annually, then the Koldfront 6 Place Setting Portable Countertop is the perfect dishwasher for you. The 200 kilowatt of power used annually is 61% less than other countertop dishwashers. Standing just over 17 inches tall, the dishwasher can fit under any cabinetry easily, therefore, no permanent installation is required. 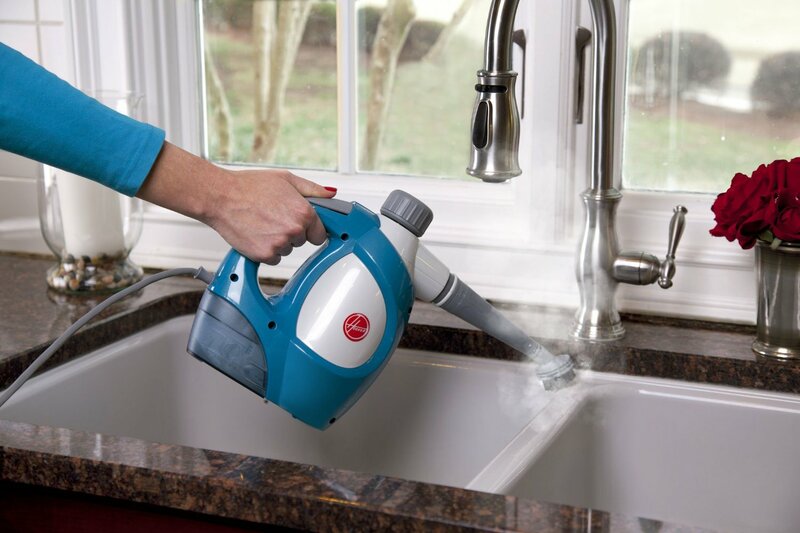 It is fitted with a powerful spray arm that helps to wash the plates and other utensils easily. It has six wash cycles and is optimized to hold 6 place settings plus a cutlery basket and cup shelf. This helps to improve the organization of utensils. 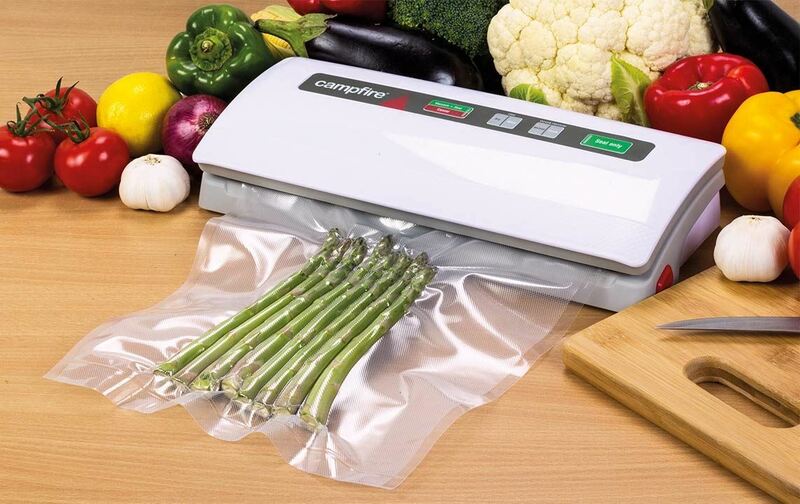 It has a built-in rinse agent dispenser which helps to minimize water spotting on dishes. The internal heater and heavy wash cycle eliminate germs and bacteria by heating water to 149 degrees Fahrenheit. 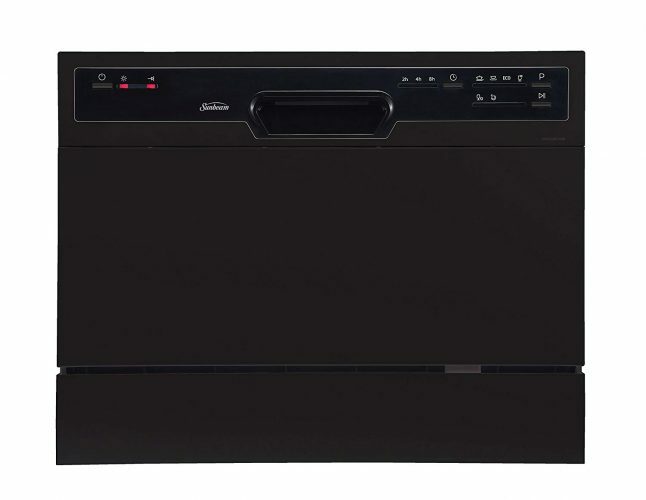 The hOmeLabs Compact Countertop Dishwasher is a powerful dishwasher that needs a 120-volt power supply. 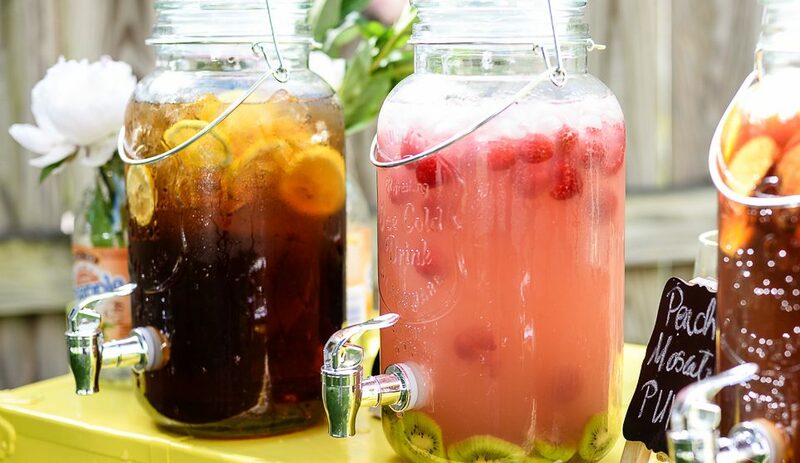 It is designed with multiple different racks including the cup holder and specific utensil holders to ensure that they are washed correctly. It is made from solid stainless steel and this will enhance the durability. To help eliminate any potential bacteria, the dishwasher can be heated up to 120 degrees Fahrenheit. It has also been energy star certified and this means that you no longer need to worry about using too much electricity on your bill. Since it is rather compact, this dishwasher is really easy to set up and should not take too much space. The dishwasher does not include a fancy faucet adapter and you will need to purchase this separately. However, it is still rather affordable and you can easily buy it. As for the price, the dishwasher itself is really affordable and should be compact enough to fit onto most countertops with relative ease. 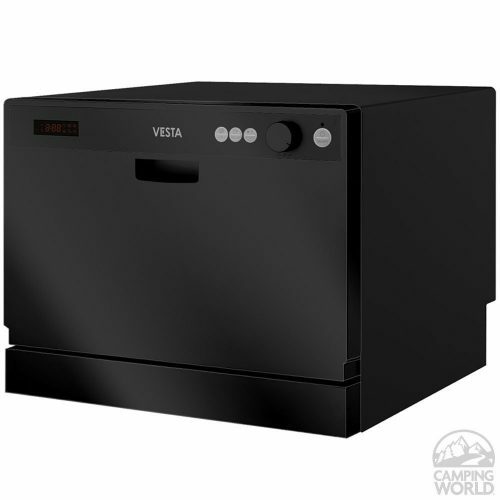 Next, we have the modern Westland Sales DWV322CB Countertop Dishwasher Vesta and this powerful dishwasher has been designed to help you save some space in your home. It comes in a stylish black color and has been constructed from stainless steel to ensure you have the maximum durability that is needed. On the inside, you have 4 different placement settings and to help diversify where all of your dishes and utensils need to come. It only uses a maximum of 4.2-gallons of water per washing cycle, but this can also be reduced depending on the cycle you choose. Additionally, it has been energy star certified to ensure the best possible functionality. It might be a little expensive for most people to buy. 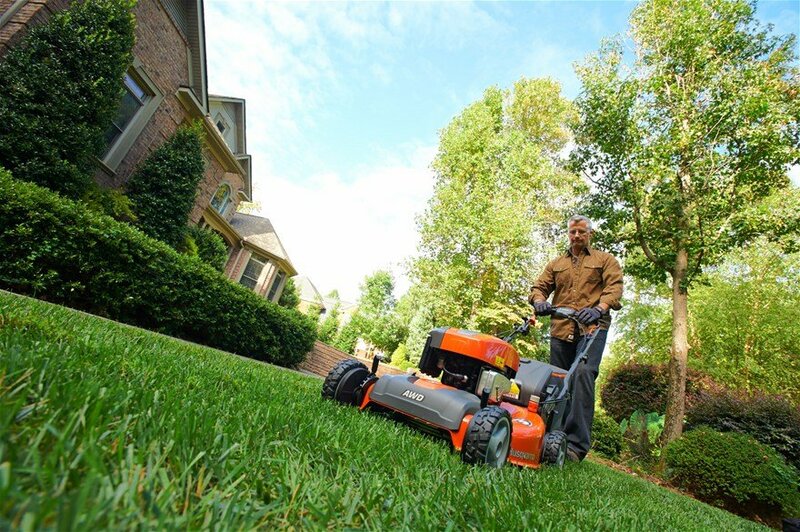 However, it is protected by a 1-year warranty that will ensure you have peace of mind. It is also worth noting that the installation process only takes a couple of minutes to complete. 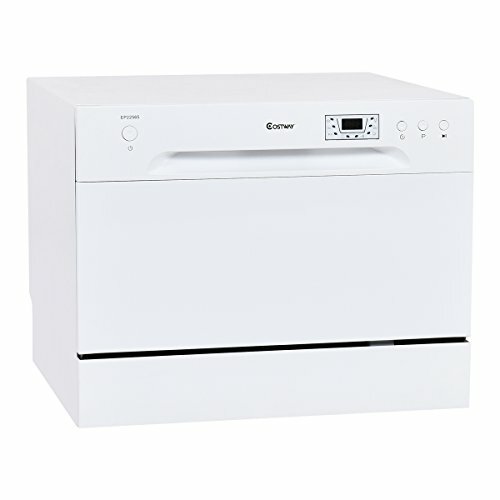 Last but certainly not least, we have the Sunbeam DWSB3607BB Portable Countertop Dishwasher and this dishwasher also continues our trend of classy dishwashers that will ensure optimal performance. 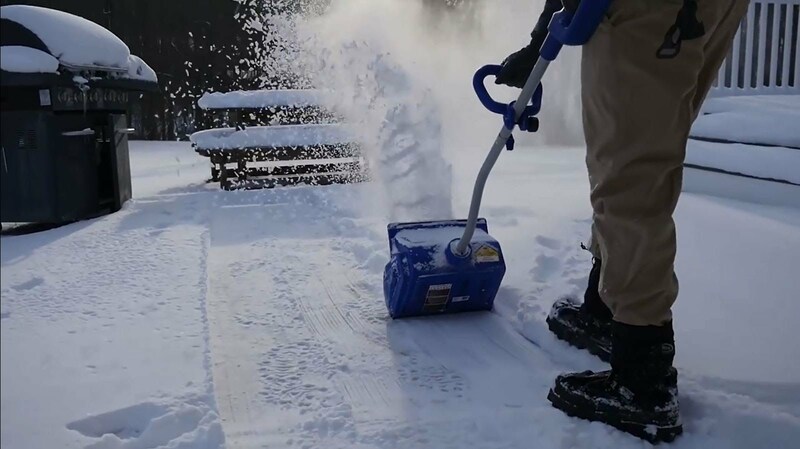 Aside from being compact and easy to install, one of the main features is the portability that makes it possible to carry it around. It includes 6 different washing settings and this will ensure that you are able to actually wash all of your specifics depending on how they need to be washed. An automated rinse dispenser will ensure the dishwasher will always clean all of your dishes and this will have it ready to be dried whenever you feel the need. As for the price, this is one of the best parts and since you don’t have to spend a fortune if you want this dishwasher. 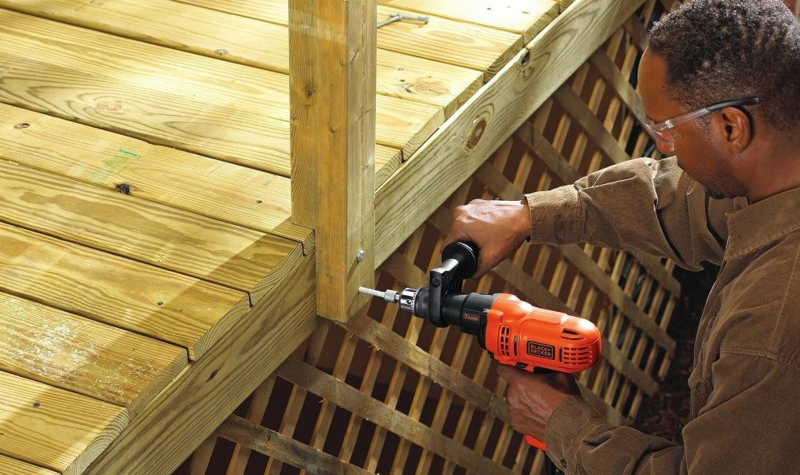 It is really affordable and won’t take up too much of your time to install. We would definitely recommend it to anyone looking for a new dishwasher on a budget. When purchasing any new appliance, you first want to consider your space. The type of appliance you look for will depend greatly on how much or how little space you have available. Next, you must think about your budget. How much are you willing to spend? 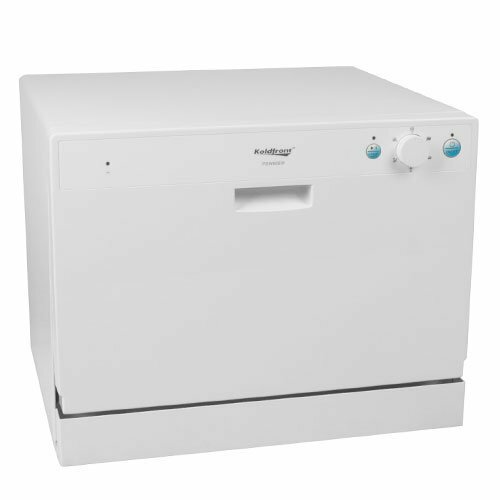 Factor in the cost of dishwasher detergent and an increase in energy/water bill when factoring in how much you want to spend on your portable dishwasher. And finally, think about what features matter to you most. Do you want user-friendly controls? What about shorter wash cycles? 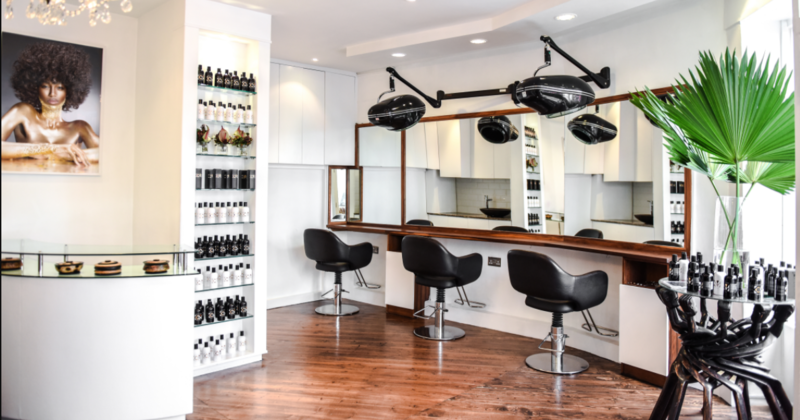 Or are you searching for a longer warranty? All of these questions are worth taking the time to consider which overall countertop dishwasher will best suit your needs. Overall, when selecting the best countertop dishwasher for you, make sure you take into consideration the space you have available, your budget and the features that you need. Once you’ve decided on those answers, you can filter out what you don’t want and then make a more educated and informed buying decision. In our opinion, we would select the SPT Countertop Dishwasher for a couple of reasons. It has the best, consistently-positive reviews on Amazon.com (it is, in fact, currently rated number one) and the price is right. 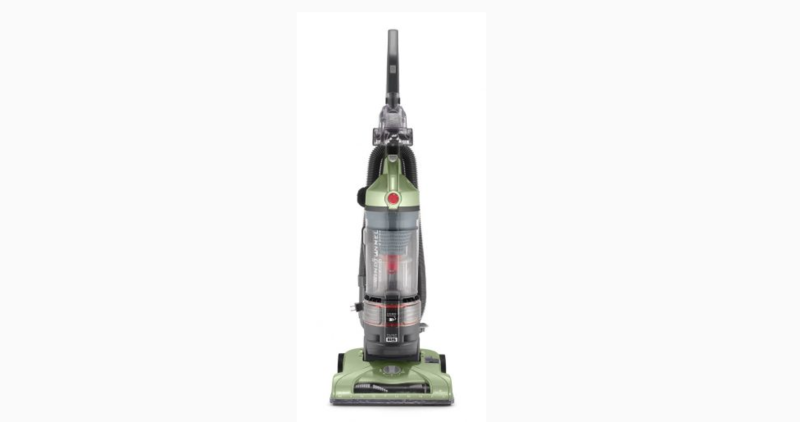 Lastly, it is packed with features like energy savings thanks to the Energy Star rating; it is quite compact, has a durable stainless steel interior and uses low water consumption. Overall, select the one that is right for your space, whether on the floor or on the counter and say goodbye to dishwashing by hand.